This space wallpaper shows the dust ring around the nearby star HR 4796A in the southern constellation of Centaurus. It was one of the first produced by the SPHERE instrument soon after it was installed on ESO’s Very Large Telescope in May 2014. 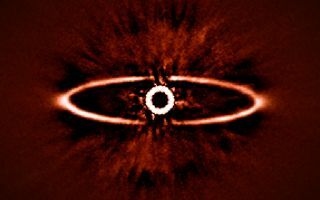 It shows not only the ring itself with great clarity, but also reveals the power of SPHERE to reduce the glare from the very bright star — the key to finding and studying exoplanets in future.